There are some people who hate the idea of hope, some said because it is dangerous and evil, other said, it is a word that describes the act of being unsure about one’s circumstances, and, essentially, wishing for an outcome conducive to one’s desires. It is based on the idea of faith, rooted in the fear of the unknown. The unknown, when you put your faith in something unknown, the chance you got the feelings of being let down is bigger. Maybe it is not hope that some people hate, it is the painful outcome ones desired when their wish are unable to achieve. That cold room was like our temporary home, with greenish wall, along with dim lights, thin carpet, also white grayish curtains. Where people wait, some who just came still got hopeful eyes, some who’s been there for quite a long time started losing its spark. Where we all sleep beside each other, that place sounds clamorous in the morning, when the dusk comes, it becomes tranquil, not in the peaceful kind of way, the peace that suffocated. We waits, sometimes we rest on that cold carpet, but mostly we wait, for the name of the ones we love after the "code blue”. I remembered how we shared our hatred towards that room next door. Maybe the uncomfortable atmosphere surrounded the room; the clacks of the keyboard, the crazy beeps sounds, cold metal beds with crisp sheets, people in white, the smell of metallic stainless steel in the open air, strand of bloods, and oh, the hisses of pain. Yes, pain of the ones we love, the one I love. I thought that the funny reality about death is when you die, you wouldn’t know that you’re dead−yet people around you become the first one who damned by sadness, some by regrets, other because pain of loss, something way funnier was, I expected that pain Grandma− truly. Hospital, also commonly known as a place shrouded in misery, sadness brought by illness led to deaths. But hey, isn’t everyone going to die anyway? The next thing I noticed was, not enough by the funny reality, there is this irony about how we held onto this unstable thin line between life and death, even worse−put a faith on it, at least that was what I did in that place. My grandma was old and her organs simply deteriorated, the last thing my family can do is hoping she will wake up and live another years−even though we knew that we will need to deal with something like this again if she is able to sober from her state of unconsciousness. Another irony is the idea of hope, yes, we held onto that word, wishing our loved ones come back to us−at least it is what I held onto, to see my grandma sitting in her usual rocking chair with her favorite yellow pillow again, combing her grey hairs−she barely has, asking me around about my still-non-existence-boyfriend, asking me whether it is tiring for me to take care of her needs every time I am home, or simply just sat there, smiling at me, in her eyes clearly shown the unbelievable feelings about how much I have grown up−she forgot she was also growing older and weaker. In that room we hate, those eyes, her eyes, even though she barely can sit−of course, she got several equipment installed on her body, that heart monitors with its continuous beep sound−painfully pierced the silence of the room, the ventilator−because she is too ill to breathe on her own, and several equipment I can’t manage to understand what’s their purpose for−beside to keep her alive. On her bed, lay awake, I barely got time to see her−only scheduled thirty minutes per day, she managed to shown me her warmest smiles, I always sense that she got a lot to say, another occasion she mouthing words I can’t simply understand, a lot of time she just held my hand tightly and nodded, one time tears fell down from her cheek yet she smiles, gave me the eyes that−if I am not being delusional, it said how grateful she was I am there, oh, I wish the universe understand how much I truly love her and I want to know what’s the unknown. That day, in our cold room, the dusk almost come, the intercom calling out a name after the “code blue”, the man with lanky figure hurriedly jump from his uncomfortable sleep, rushing out to the room we hate, I lay awake unable to get back into my dream I can’t even remember anymore. Thirty minutes passed, he hasn’t come back, and I remembered he finally came back after almost an hour. I unconsciously sat up when he walks into our cold room, not only me, we are all awake, waiting for the news he will bring, shaky and weak he smiled, his wife is finally able to get back into usual medical ward, yes, after five whole months she was going back and forth the ICU (Intensive Care Unit) and HCU (High Care Unit), his expectation last sweet. How grateful we was, some give him a hug, some praise the God, and other got motivated by his results. Other days has passed, after a week, another dusk just come, and the intercom calling names after the “code blue”, three names one at a time. The horror in our faces−the family of the loved ones being called tensed the atmosphere of the room; we rushed into the room next door. That thin lines between fear and hope simply emerged. That room colder than our room, gave the chill down my spine−no, not because of the temperature of the room, it is how the man on the bed across from my grandma’s situation. The first thing I sense was, he is dying, hurts seeing his wife standing beside him, trying so hard to contain the tears of overwhelming pain, his teenage son−that I have an opportunity to be acquainted with, was crying so hard in disbelief. Their loved one passed away at six o’clock sharp in the morning. Still the same day, strangely, the day passed slowly, the dawn came. Different from before, my family got called to the doctor’s private room for a talk. 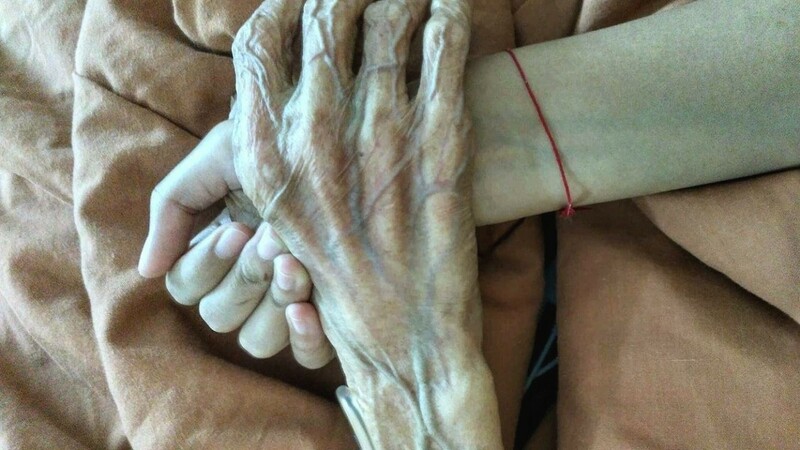 Sensing something probably went wrong, I held my grandma’s hand who’s now unconscious−eyes closed. I know, the fear is there, creeping me out how I sensed that she got weaker. My mom, my aunt, and other relatives being called to the room we hate, surrounding my grandma’s bed, we started to pray against the judgmental beat of the heart rate monitor sound. Like that cliché soap opera when the main character is in the verge of life and death, her heart rate went up and down, she is dying, unstable, in crisis. Goes back and forth, finally the doctor said she is fine, she made it. I should be grateful, yet I am uneasy. We walked out, feeling relieved. Funny it did not last that long, my guts proved because the next thirty minutes we all got called again, we prayed again, tears fell down, pain, until the monitor shown a flatline−prolonged monotonous beep, she is gone. The moon shines so bright against our gloomy faces; we ended up held onto the power of hope from surrender.